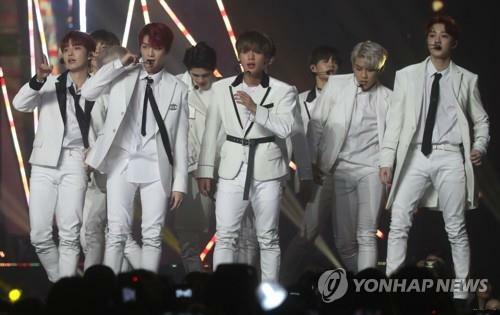 SEOUL, Nov. 15 (Yonhap) — The main track of boy band Wanna One’s first full album was leaked four days ahead of its official release, sources in the K-pop scene said Thursday. They said a music file and lyrics for “Spring Breeze” from the album titled “1¹¹=1 (Power of Destiny)” have spread quickly across social media since Wednesday. This is not the first time that the band has experienced an illegal leaking of its material. In March, files for “Boomerang” and “Gold”, both on the band’s second EP, “0+1=1 (I Promise You),” were uploaded to the Internet five days ahead of the record’s release. Meanwhile, chances are high the new release will be the popular project band’s final album. The group, which was formed through the 2017 survival competition TV show “Produce 101 Season 2,” is set to disband after their contract expires Dec. 31.